Gluten Free, Crust-less, Vegan, no added sugar baked dessert? We went on a pretty strict cleanse last month and this is one of the healthy recipes that we’ll take from our experience. It really is a guilt free dessert! Cut the apples into thin-ish slices. 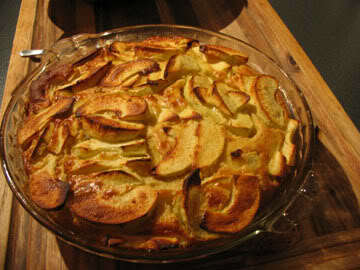 Drizzle the apple slices with the lemon juice and add the cinnamon and honey. Arrange on a glass pie dish. Drizzle with a little extra honey. Bake until the top is crispy. I found that the apples stuck to my pie dish, but I didn’t want to use oil or grease. I thought that if you added the nuts to the bottom (and the top) that it might help with sticking problems? Might not though! Beware, you’ll have to soak this sticky dish afterwards.